CURA 2 Dropbox Download. Click to download. We're excited to announce the collaboration between WANHAO and MYMINIFACTORY, featuring an updated CURA 2 with direct MODEL download and print, more slicing options, and better print quality than ever before. 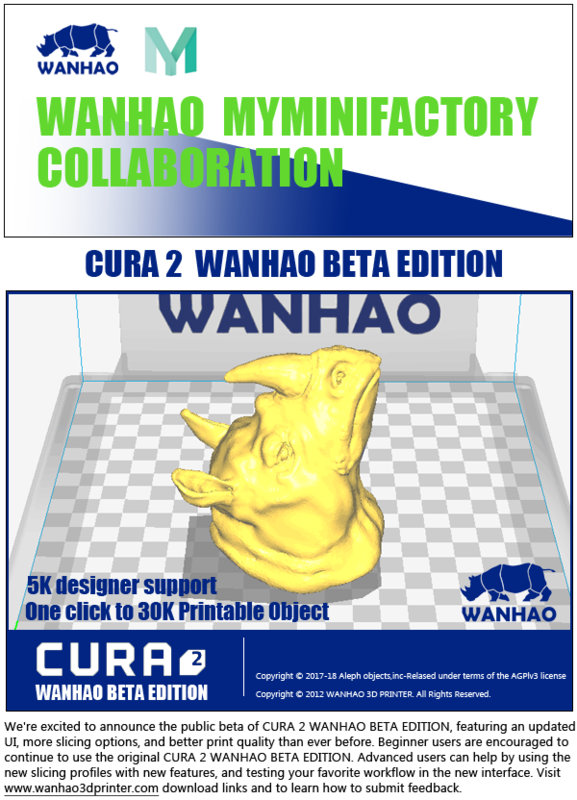 Beginner users are encouraged to continue to use the original Cura WANHAO Edition. Important Notice: improper Firmware upgrading may cause brick the motherboard or screen. We would charge the service and shipping cost USD30, if customer want WANHAO to send the flashed micro SD card to recover the machine.